You have knowledge to share, and you want to create an online course. But there are so many online course platforms out there. 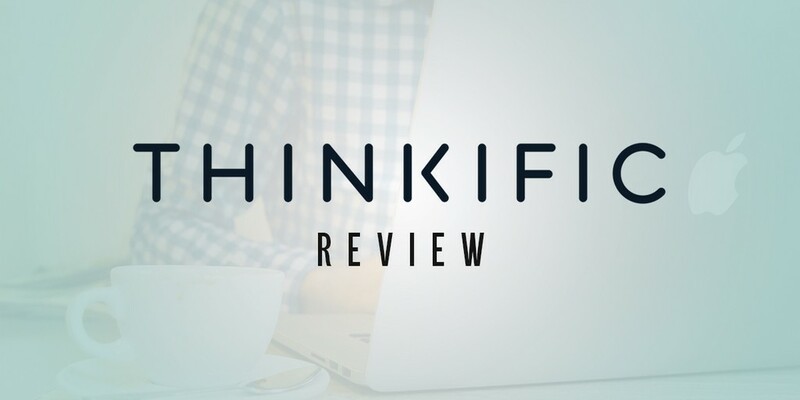 In this review I’ll take a look at Thinkific, one of the most popular online course platforms. We'll look at the main features it offers and how it stacks up compared to other options for creating and selling your online course. Thinkific was founded by a Vancouver teacher, Greg Smith, who was looking for a way to reach a larger number of students. Nowadays, there are 70+ employees at Thinkific. The company is growing so rapidly that it actually doubles every year. Thinkific can be used in many ways and serve several different purposes. You can use it to create all sorts of online courses – and there are thousands of course creators who are making money by selling their courses through Thinkific. You can see some of these online course examples on my Inspiring Courses page. It can be used by companies to carry out internal training for their staff. Thinkific is even being used by schools and universities to help them teach online courses. Creating an online courses in Thinkific is a very simple process. There’s no messing about with codes or design software. Thinkific comes loaded with many options for customisation. The management of students is easy. The marketing and promotion of your courses relies largely on well-thought-out and automated processes. Keep reading to find out more about Thinkific’s most important features. Let’s start from the very beginning. The first step involves signing up with Thinkific. You will get an invitation by email to watch a live webinar where you can ask any questions and get to know the platform. The next step involves logging in. Once in, you’ll find informational videos and useful tips that will help you navigate your way through Thinkific much faster. I’d suggest starting off with a free plan before moving on to the more advanced plans. When you come across something on the site which isn’t free, you will be greeted by a detailed explanation of what it is and what you are supposed to pay for. A clever and intuitive interface for the building and designing of your courses is a must for a platform like this, and in this regard Thinkific delivers. Thinkific allows you a lot of control over the designing process. Also, you don’t need a website of your own, so you don’t have to worry about hosting either. As I mentioned above, Thinkific has an easy and intuitive tool for designing your courses. The interface is based on the simple drag and drop. The editor allows you to stack all the content you want to include and then simply rearrange however you choose. You don’t have to deal with any CSS or HTML codes. Another great thing about the course designer is that it supports most media types, so there are almost no limitations to what you can include in your courses. This means you can include pictures, quizzes, surveys, different types of audio files, PDFs, and so many more. Any files or content you include in your courses are hosted on Thinkific’s own servers, so you don’t have to worry about hosting or having enough space. No matter the file size, they are pulled from very fast servers, so they’re always accessible. All the elements that you want to include in the courses, such as logos, color schemes, and banners, can be easily edited without ever reverting to CSS or HTML codes. Still, if you’re experienced with coding, you can go wild and customise your site and courses as much as you want. Here we have yet another area in which Thinkific excels. The management of all your students can be easily handled with a very user-friendly and visual tool. It includes names, pictures, and contact info for all your students. Also, it shows in great detail how far each student is in any given course. You can communicate with entire communities, or you can choose to send personalised emails to any of your students. Also, you can share report cards and completion certificates with any student. The platform offers optimisation for mobile devices, and you can also incorporate language controls and offer your students unlimited number of replays for any materials included in the courses. Another great aspect of Thinkific is the inclusion of several promotional and marketing tools, in spite of the fact that most of them rely on automated processes. This is very handy for when you want to drip any of your content to some or all of your students. You can create schedules to send out automated emails that can be further targeted to just the right audience. You can also use these tools to handle the pricing and all the payment options for your students. If you need to promote your courses outside the confines of your own website, you can offer a modest affiliate marketing programme to bloggers and all those people who recommend your stuff. Another option is to include coupons in ads that are proven to attract newcomers. The dashboard gives you the ability to track all of the aforementioned options, and that’s the place which also provides you with an option of linking Facebook, Adwords, and other types of social media account and analytics tools. By doing so, you will be able to determine which channel attract the most students. Thinkific offers no live chat or phone support, but you can contact them via email. They are also very active on their own public Facebook group. Other than this, you can also rely on their Help Centre section of their website, which contains many resources that can help you solve issues or learn how to do something the proper way. One of the best things about Thinkific is that it comes with a free plan, and even that free plan has a good twist to it. In most cases, free plans are just trial versions which are quite limited, so you can’t really experience and explore all the possibilities of the platform. But not for the Thinkific free plan. It allows you to build a student base and launch an online store where you will be able to sell your courses, and all of this comes at no charge. If you want to try out any of the more advanced options, you can get a free trial for that, as well. 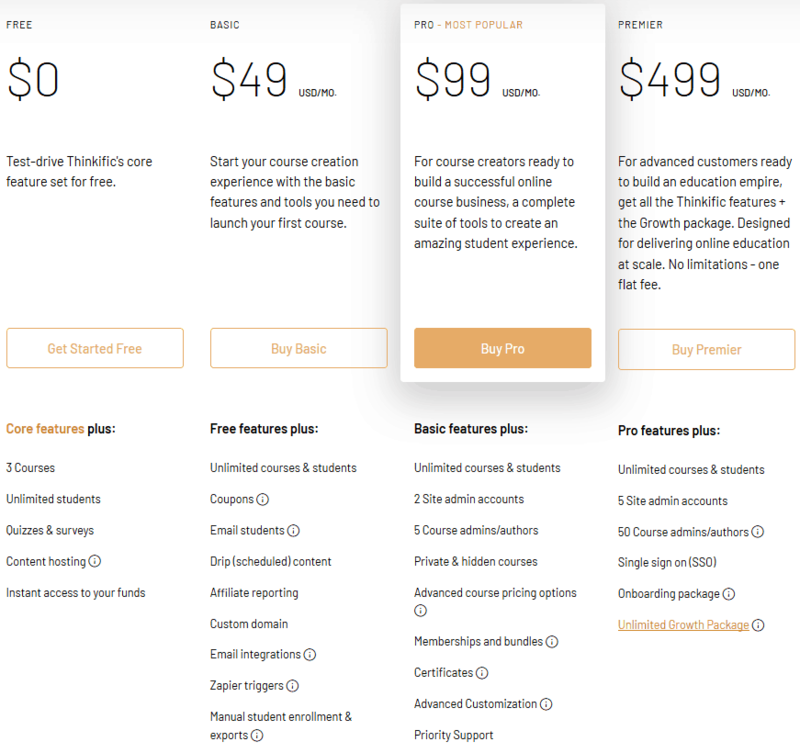 This is something no other learning management system or platform will offer you, but let’s check out the paid pricing plans and what comes with each of them. The free plan gives you all the essential Thinkific features at no charge. With this plan you can create an unlimited amount of courses, you also get content hosting, and it will give you access to all the funds and provide you with basic types of integrations. It is a great opportunity for all those who can’t afford monthyl fees yet and are waiting to start seeing some income from their courses. The next step up is the Basic plan, which will cost you $49 per month. If you think you’ll be selling a lot of courses online, you will appreciate the fact that this pricing plan drops the transaction fee to 5 percent. The Pro plan will cost you $99 per month, and the plan includes all the features from the previous two, plus a whole lot more. Also, the company doesn’t charge you any transaction fees in this pricing plan. As the name suggests, this is the most advanced pricing plan, and it is quite expensive compared to the previous three, at $499 per month. It goes without saying that this plan doesn’t involve any transaction fees. Paying upfront for an entire year can also save you considerable amounts of cash. If you do so, the Basic plan will set you back $39 per month, the Pro plan comes down to $79, while the price of the Advanced plan drops to $399. In essence, you get about 20% off if you pay in advance. I think Thinkific is worth checking out for anyone who wants to make money selling online courses. The interface is very intuitive and you don’t have to bother with having your own website and the hosting, plugin set, onging maintenance and more. Thinkific is unique in that it has a free version which includes all the core features. This makes it easy for you to give it a go and decide for yourself whether Thinkific works for you. You may also want to see how Thinkific compares to other options by checking out my other review where I compare Thinkific vs Teachable vs Kajabi.